I have a Linux disk archive in a remote location, and *also* a tape loader hanging off the back of a separate Windows server, in that same location. On that server I have a Veeam proxy, understandably doing transport duty for the tape loader. When transfers from disk to tape are happening, all the traffic stays local to the location, and moves from the disk, to the proxy, to the tape drive. The time has come to replace the tape loader. Ideally I'd like an ISCSI loader, like a TL2000, in order to entirely remove the single server acting as a tape proxy. 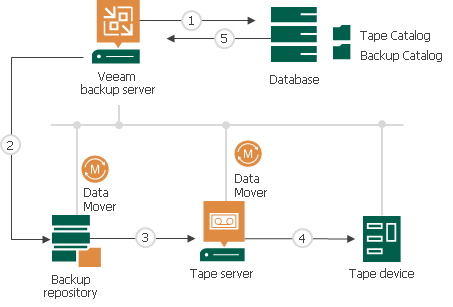 Firstly though, I'd like to clarify how Veeam traffic would behave in the event of the Tape proxy being removed? The central Veeam B&R 9.5 server runs in a VMWare stack elsewhere in the building, so I'm not keen on the traffic going back and forth across the network just to get from the disk storage to the tape target. Will the Veeam set up a stream of data between the Veeam linux service and the ISCSI tape drive? Or will it try to hairpin it to Veeam B&R and back? I suspect it might be the latter, for ISCSI reasons! Or will it try to hairpin it to Veeam B&R and back? I suspect it might be the latter, for ISCSI reasons! This one. You need a Windows server to act as a tape server. Please check this diagram for a detailed dataflow. Good to know, thank you. Stuck with the server then, and I can just continue using SAS too.